The turbine built near historic Milford in Prince Edward County; citizens celebrated in the Milford hall yesterday. 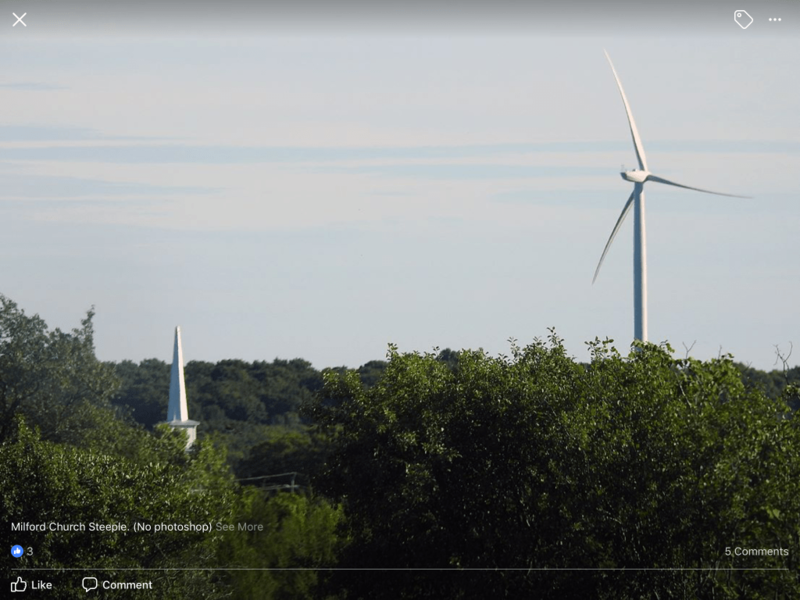 After years of fighting one industrial-scale wind power project after another, after the Ostrander Point project was cancelled, and after the huge “White Pines” project was cancelled by the new government, the people of Prince Edward County finally got together yesterday for a celebration. It was a simple affair: a potluck supper in a community hall, a modest gathering of people from all over the expansive county, united in a single cause — to prevent the industrialization of a fragile environment, harm to the environment, and serious impacts on people. As one of the founding communities that are part of the 30-plus-strong coalition that is Wind Concerns Ontario, the people in Prince Edward County have been, in many ways, a beacon of hope for others. They suffered defeats and setbacks, they enjoyed partial victories that only diminished the threats, and they witnessed the worst of the McGuinty-Wynne governments’ push for wind power at all costs, as decisions were made behind closed doors. At times, it seemed all common sense and decency had been lost. Naturalist organizations protested the harm to wildlife. Even a former senior Liberal government Cabinet minister came out swinging against the White Pines project, to no avail. Our congratulations and best wishes to the people of “The County”. And now, there is more work to be done. All the things the people in Prince Edward County fought against — harm to the ecosystem, death and destruction (including possible extinction) of wildlife, damage to water and the water table, and finally, via the unique noise emissions from wind turbines, harm to people — all these things are going on across Ontario right now. While it is a source of hope that the Green Energy Act will be gone, the fact remains that there is a lot of damage to repair. First, the noise emissions, including low-frequency noise, must be dealt with. There are literally thousands of formal reports of excessive noise, a significant proportion of which also carry reports of “adverse effects” including health problems, often linked to sleep disturbance. These must be addressed and resolved, immediately. Water wells and the damage done to them by vibration from construction and wind turbine operation (think of them as giant tuning forks stuck in the ground) is another problem. In Chatham-Kent, dozens of families have no water at all, or their water is so contaminated by particles it is unusable. The new government has promised an investigation and resolution–this also must happen immediately. We engineers had provided Ontarians for many decades with reliable and cost effective energy – until certain third class lawyers, teachers or social workers took over with their silly and unproven dogma about green energy, spent many billions, caused energy cost tripling, environmental destruction and endless sleepless nights to thousands. No open discussion was tolerated. Similar to the forced Soviet industrialisation of the 1930’s. But that industrialisation at least contributed towards the Soviet Union’s victory over Hitler’s Nazi Germany. Mc Guinty/Wynne legacy is much worse: thousands of rusting, useless, animal killing monsters contributing NOTHING but endless costs to the Ontario society. There is an urgency about the need to turn the turbines off that are too close to or in some cases sited in clusters surrounding peoples homes and especially for residents whose homes are too close to substations. Forced relocation is unacceptable. Anyone who thinks it is acceptable needs their moral compass replaced. We now have residents who are coming forth with very serious cumulative health impacts because their human rights have been violated. They have medical records to prove their case. These are innocent people who did not consent to being harmed. We all saw the way the previous government turned a blind eye and came up with one delay tactic after another and left residents who were reporting harm with no effective solutions as they clearly demonstrated their genocidal ideology toward rural residents. Will this new government do the same thing? The thing that many people don’t realize is that rural communities were working hard to revitalize before these turbines were imposed on them. Prince Edward County is a perfect example of this. So is Huron County. There are rural residents who absolutely love living close to our Great Lakes. True environmentalists realize that being so close to nature is the ideal way to cultivate an awareness of the interconnection of species, which is so essential to our collective future. An ‘indomitable’ spirit is what it will take to save our rural communities against this ill conceived agenda to ‘financialize’ the wind.